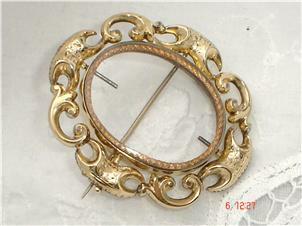 Rarely do I have the pleasure to present such a Fabulous Victorian piece such as this crafted from solid gold. I am always taken by the attention to detail with English jewellery and this is certainly no exception. It is very large and of exquisite design and styling. It is three things – Pendant, Locket and Brooch or Pin with the added bonus of being a “spinner” meaning either side is able to be displayed when worn as a brooch/pin. The large window is set with what could be a crystal rather than glass due to its clarity. It is framed with a gorgeous foliate and scrolled border with fabulous chasing and engraving. The depth of detail in the decoration and the construction is of the highest quality. 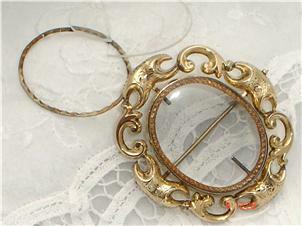 Due to the thickness of the locket, you could easily enclose a lock of hair or some other substantial trinket or memento. 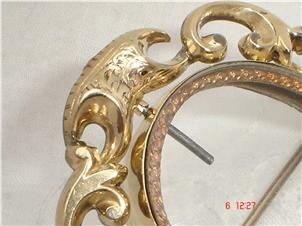 There is a pin to the edge which when released (pulled out) will allow the locket to turn and then lock in place. The back has a small loop to house a jump ring to attach a necklace to as well as the original tube hinge and C-catch closure. It has that silky smooth feel associated with solid carat gold and expected of Quality antique jewellery. It has that warm, buttery hue so much nicer than the pictures suggest. Better-than-Excellent Antique condition! For a piece its age it really is spectacular. It has a teeny pinhead sized dint to the back (a test mark) mentioned for accuracy. As pictured, one of the covers is broken but I have both the pieces which could be used as a template to have another cut. This is perfectly wearable/usable as-is – this is only a minor detail.